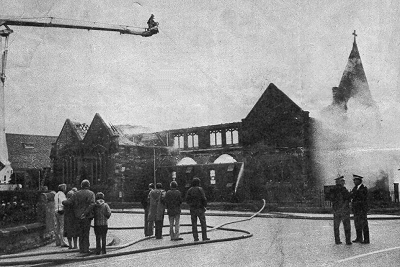 On this page we present some reports from local and national newspapers on the fire which destroyed the original Church at 4am on 19th July 1975. Stories from the "The Scotsman" and the "Fife Free Press". Picture taken by Californian visitor, Mr David B. Scott, a vice-president of a San Francisco insurance brokers company. Mr Scott left Kirkcaldy 20 years ago. Kirkcaldy's second major fire in less than 48 hours completely destroyed St. John's Parish Church in Meldrum Road in a 4am blaze today. Firemen from Kirkcaldy, Thornton and Methil tackled the flames which leapt high above the beautiful 65-year-old building. 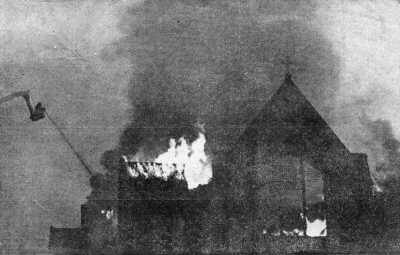 The church was well alight when smoke was spotted by Police Inspector John Black, returning from duty to his home in nearby Matthew Street. All surrounding streets were cordoned off as police alerted families in the surrounding houses in case they had to leave their homes. Church members and local residents watched as the building disintegrated under a 200-foot pall of smoke. Firemen kept the blaze from spreading to a garage next door and from the church hall. 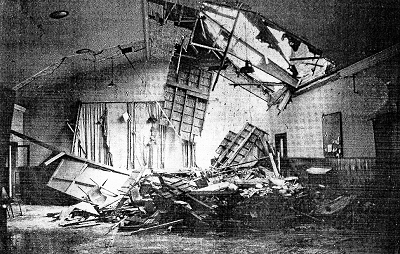 Then the north gable of the church collapsed - and fell through the hall roof. Firemen worked in danger of the other gable collapsing until a demolition squad was called in. The minister, the Rev. Samuel McNaught, who came to St. John's only in April, preached a sermon last Sunday on the beauties of the church which had been recently renovated and had a large stained glass window installed. Mr. McNaught, who recently moved to the town with his wife and their young son from Port Patrick, Wigtownshire, was shocked as he watched the flames. He said: "I am desolate, but there is more to a church than a building". Police have stepped up their hunt for a fire-raiser after the third mystery blaze to hit Kirkcaldy in three weeks. The latest outbreak completely destroyed the Gothic-style St. John's Parish Church - only 48 hours after fire gutted the major part of Torbain Primary School. Damage to the church is estimated at over £250,000. Just over three weeks before the latest outbreak, firemen managed to save St. Brycedale Church when flames swept through a hall at the rear of the building. 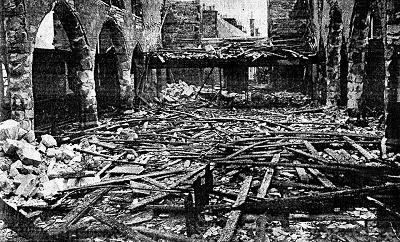 As police and firemen sifted through the debris of St. John's, which stood at the corner of Elgin Street and Meldrum Road, Fife's Chief Constable, Mr Robert F. Murison, called a hasty meeting of representatives of other churches in the town. He asked them to step up their supervision of their buildings. An appeal to the public to help in the hunt for the fire raiser was made by the head of Fife CID, Detective Superintendent Tom Grieve. He said: "In the case of both St. John's Church and Torbain School, there are obvious indications that the properties were willfully set alight. "It is difficult to say at this stage whether or not there is any connection between the two fires. "Extensive police inquiries are being made, and CID and uniformed patrols are being stepped up during the hours of darkness." Detective Superintendent Grieve added: "The person or persons responsible for these vicious acts of violence against properties must be caught. "I would ask any member of the public the come forward with any information which may be of assistance to the police in their inquiries. "Any information will be treated in the strictest confidence". Police are also anxious to trace four youths, aged between 16 and 20, who were seen in the vicinity of St. John's less than two hours before the 4am blaze was spotted. The blaze at St. John's in the early hours of Saturday morning was spotted by an off-duty police officer. Inspector John Black was on his way from Kirkcaldy Police Station to his home in Matthew Street when he saw the smoke and flames and raised the alarm. Five units of Fife Fire Brigade from Kirkcaldy, Thornton and Methil - including an 85-foot platform - raced to the scene. But although they managed to prevent the flames spreading to a nearby garage and houses in Meldrum Road, they were unable to save the church. 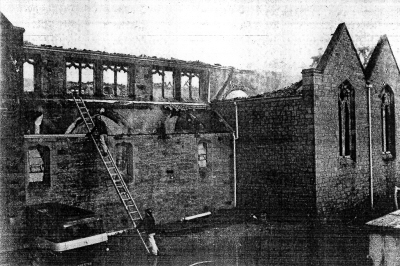 At the height of the blaze, the gable wall collapsed and fell through the roof of the adjoining church hall. Neighbouring householders - some of them members of the 1000-strong St. John's congregation - were warned about the fire, but no-one had to be evacuated. 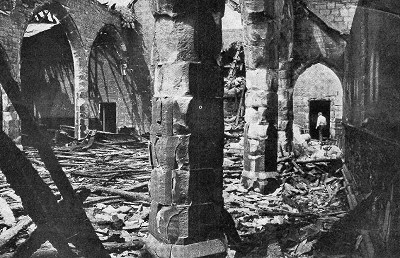 Afterwards, police sealed off the area around the church as demolition workers moved in to make safe what remained of the building. The 32-year-old minister of St. John's, the Rev. Samuel McNaught, came to Kirkcaldy from Wigtownshire only at the end of April. After surveying the burned-out church, he said: "I am desolate. "But there is more to a church than a building, and the life of the Church will continue." The debris-strewn remains of St. John's. In the background is the huge hole in the roof of the hall caused by the collapse of the church gable wall. The massive pillars stand out starkly amidst the rubble. 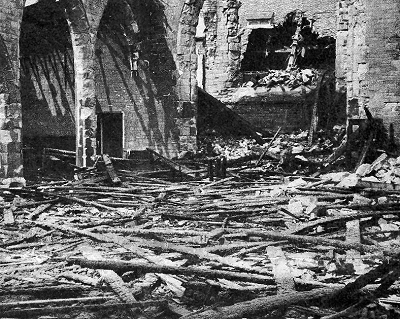 The devastation of the church is complete, as vividly illustrated here. The gable wall of the church crashed through the roof of the hall. The sealed casket of St. John's, laid in the foundation stone in 1907, has been recovered intact from the ruins. But what is inside will remain a mystery for the time being. The minister, the Rev Samual McNaught, said: "I have deposited the casket unopened in a bank for safe keeping. "It will be up to a meeting of church officials whether or not it is to be opened. My idea would be that when the new St. John's is built, the original casket should be placed along with a new one in the foundation stone." The casket was discovered amongst the ruins of St. John's by demolition foreman Mr Tom Lawson of Kirkcaldy. Also recovered from the debris was a plaque bearing the names of the war dead of St. John's, and a brass plate which marked the opening of the transept in 1959. Mr McNaught preached his service on Sunday in the canteen of the nearby Meikle's carpet factory. Before a packed congregation, he christened 15-month-old Heather Ann Shulenberger - whose parents traveled 3000 miles to have her baptised at St. John's - and described her as the "symbol of the new St. John's". Pledging that a new church would rise from the ashes of the old building, he told the congregation: "This christening is the one bright spot to cheer us up on this day." Heather Anne's parents, John and Ruth Shulenberger, traveled from Morrestow, New Jersey, so that their daughter could become the third generation of the family to be baptised in St. John's. Mrs Shulenberger originally comes from Kirkcaldy. The arrangements for the ceremony had been finalised only hours before the church was burned to the ground. Baptising Heather Ann from a silver bowl, Mr McNuaght said: "This young child has traveled thousands of miles to be baptised in St. John's. "While this place is a factory canteen, today it is St. John's." In fact, the carpet factory building was where the congregation of St. John's first began. Mr McNaught said: "The congregation began originally as a breakaway set from the old parish in Kirkcaldy, and the first group met in the same factory, which was then known as Wemyss Linen Works. "We have now temporarily gone back to our birthplace." Sunday services will be held in the factory canteen for the next few weeks, until other arrangements can be made. St. John's was founded in September, 1907, the memorial stone being laid by the then Moderator of the General Assembly, the Right Rev. J. Mitchell. The church was dedicated a year later. The suite of halls was added in 1931, and the kitchen and cloakroom premises extended in 1967. In 1969, a magnificent stained glass window was incorporated in the building at a cost of £2,500. Mr McNaught held a meeting of elders on Saturday afternoon in the church's small hall, which suffered only water damage. He told the elders that he had received a telegram of sympathy from the last minister of St. John's, the Rev. George M. Graham, who left Kirkcaldy last year to take up a new charge at St. Luke's Church, Paisley. The blaze at St. John's brings the total number of major outbreaks of fire in the town since Christmas to five. The Odeon Cinema was completely gutted in the early hours of Boxing Day. Two youths were later found guilty after trial at Kirkcaldy Sheriff Court of maliciously setting fire to a kiosk in the cinema, which led to the £250,000 blaze. In April, Fife's biggest store - the CEFCO department store in High Street - was burned to the ground. Unlike the other fires - which all took place in the early hours of the morning - the CEFCO blaze which is thought to be accidental, started around lunchtime.